We love getting mail from our couples who we had such a fun time celebrating with! 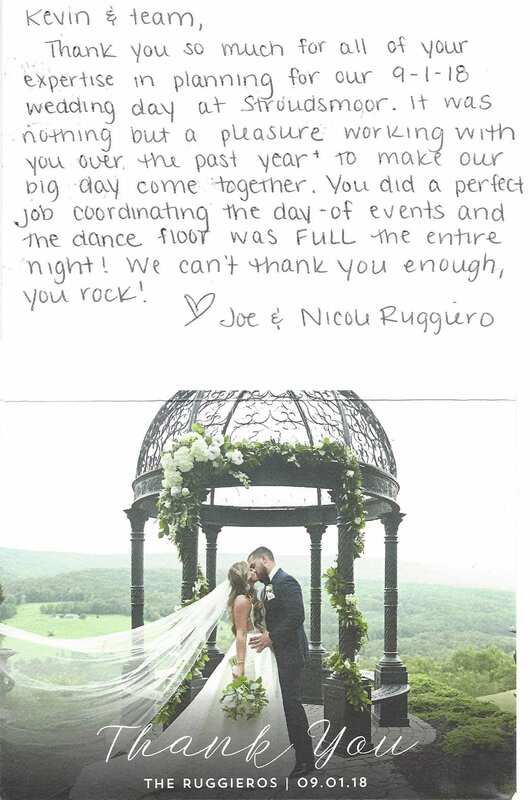 Mr and Mrs Joe Ruggiero had such a great time celebrating with us they sent a personal thank you card to our team! Thank you so much for all of your expertise in planning for our 9-1-18 wedding day at Stroudsmoor. It was nothing but a pleasure working with you over the past year to make our big day come together. You did a perfect job coordinating the day of events and the dance floor was FULL the entire night! We can’t thank you enough, you rock! "Kevin, We wanted to thank you for your services at our wedding! You did a great job and everyone was talking about how much fun the wedding was! It was funny that a majority of the pictures we have no one was sitting in their seats, there wasn't even enough room on the dance floor. Thanks again for making everything go so smoothly at the reception!Thanks, Josh & Jess"